In honor of George Washington and the cherry tree and President's Day and all that sort of thing. I don't make these often enough, because I never seem to have dried cherries and almonds in my cupboard at the same time, but they really are worth it. I love the flavors of almonds and cherries together!! You can make a cherry-syrup with canned, dark cherries if you want, My kids prefer a little powdered sugar. 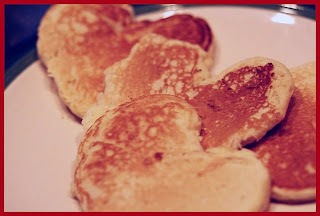 I don't always make heart-shaped pancakes, I have little luck with them (as you can see from my picture), but since it was a lazy, happy, sleep-in vacation day and just past Valentine's I decided to attempt some creativity and indulge my kids. Chop dried cherries coarsely. Pour enough hot (almost boiling) water over them to just cover. Add almond extract and stir well. Let sit 10 min. while mixing rest of ingredients. Mix liquid ingredients (tofu, milk, margarine) in one bowl and the dry ingredients (flour, soda, salt, almonds) in another. Gradually add liquids to dry until well mixed. Add more soymilk if batter is too thick, more flour if batter is too thin. Drain cherries very well (I actually squeeze them with my hand a bit) and add to pancake batter. Heat griddle or large nonstick skillet over medium heat until hot; oil griddle. I have been craving pancakes lately! Thank you for the recipe. i haven't made pancakes in a while, and i've never made red velvet cake. i'll have to get on that. Cute! I have dried cherries and almonds in my pantry now! Hope you and the family had a good day on Monday.